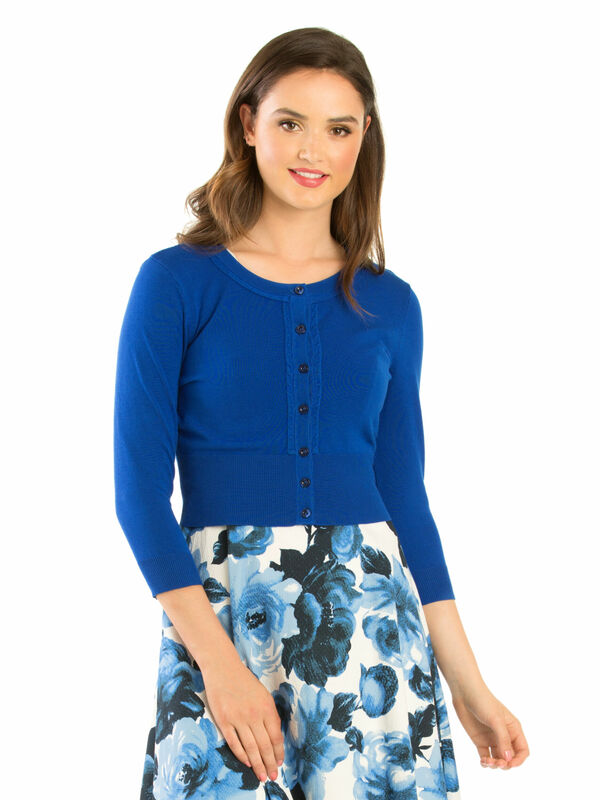 Chessie 3/4 Sleeve Cardi https://www.review-australia.com/au/chessie-3-4-sleeve-cardi-royal-blue/RE18KW085.REBLU034.html In a gorgeous Royal Blue, the Chessie 3/4 Sleeve Cardi is the pop of colour your wardrobe needs. Made from soft light-weight fabric with button-through detailing, this cardi can be paired with weekend summer dresses or an understated work outfit to achieve effortless chic. Chessie 3/4 Sleeve Cardi is rated 4.9 out of 5 by 111. Rated 5 out of 5 by KateB from Soft New Fabric! I have a few Chessie cardigans that I've purchased in the last 6 years that I've been buying Review clothing and I must say that the fabric of this seasons colours in Wedgewood, Tangelo and Coral Rose are the most beautifully soft and comfortable material of all Reviews Chessies (as mentioned by another Reviewer) . I am a size 10 and this cardi fits comfortably over Review tops, even the thicker knit styles as it has a bit of stretch to it. Review, PLEASE continue to make all of your upcoming cardigans in this gorgeous fabric if consistent sourcing of material is at all possible! Many thanks to the design and dressmaking team for providing such beautifully feminine clothing. Rated 5 out of 5 by Jacqui1 from Lightweight, smart looking and easy to wash. ¾ cardi’s are a spring staple. They are perfect to throw on over any Review knit top. 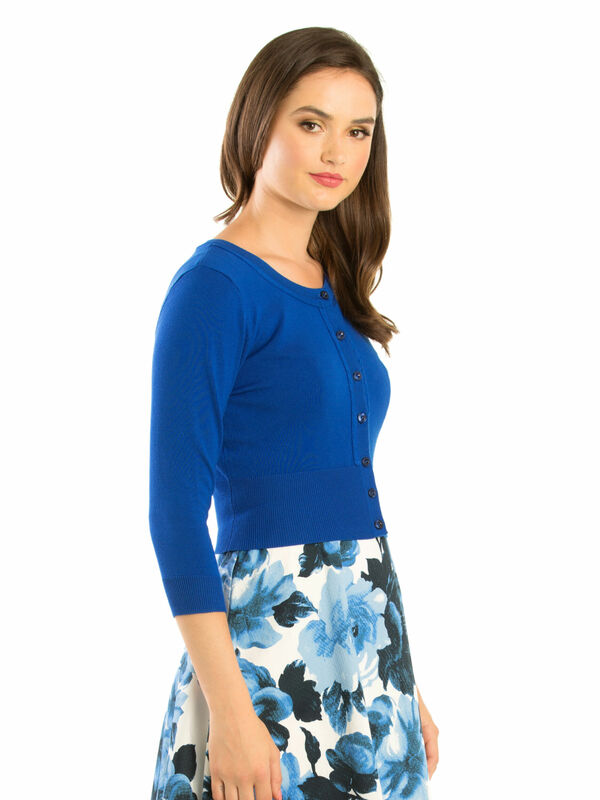 Often the colour of the cardi is an exact match with the knit top which makes you look very well coordinated. 3/4 cardi’s fold compactly into your handbag. Great for work or with jeans. I love how Review introduces new colours every season but also keeps the ‘must have’ colours. My only wish would be that Review made the same variety of colours in the long sleeve, out of wool for winter as the 3/4 viscous is just not warm enough. Oh well, I’ll just have to buy a gorgeous Review coat. Oh wait! I’ve already done that. Rated 5 out of 5 by Tash13 from Perfect cropped cardi Well, this is my 13th 3/4 sleeve cropped cardi from Review (a mix of the old Bella’s and Chessie) so I think that says it all! Despite having some for many years, none of them have even begun to show signs of wear - though I should say, I wear a uniform for work so these are only worn on days off but they all still look virtually brand new. 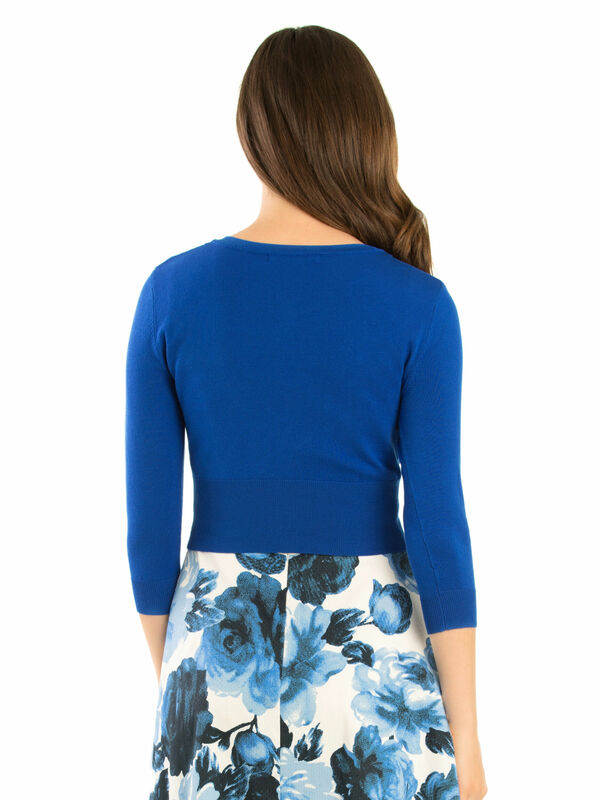 These cardi’s are perfect for my high waisted skirts and dresses, and hit me at the right spot despite my long torso. I’ll continue buying these as long as you continue making a variety of colours. I only wish Review would release some more short sleeved cardis as I have a navy blue one that gets a lot of wear over summer and would just love to add some other colours. Rated 5 out of 5 by Pix_85 from Lovely colour! Love the colour of this cardigan. Size is generous fit. I get lots of compliments every time I wear. Rated 5 out of 5 by DiW16 from Exceptional colour This fabulous cardigan fits well as do all Review cardigans and looks very smart, but the colour is what I am so impressed about. I shop from my Review app on the phone and sadly the phone photo didn't do this cardigan justice on the wonderful colour it is. When it arrived I was so pleased and it now can be worn with my many other Review items. Well done Review - a feminine pink with a splash of warm tropical apricot for this lovely 3/4 sleeve Chessie cardi. Rated 5 out of 5 by Emmy from Beautiful Colour This a gorgeous chessie, the colour is so vibrant and matches with so many things! Will be on regular rotation in my wardrobe. Rated 5 out of 5 by melmel1 from Goes with everything This is my second one of these cardigans in a different colour. You can wear them with everything from jeans, to skirts to dresses. The best thing about this cardigan is you can extend your summer wardrobe through autumn as it gets cooler. The fabric is very soft and it washes and wears extremely well. You will definitely get the wear out of it.